Understanding Portable Fire Extinguishers | Flue Steam Inc. 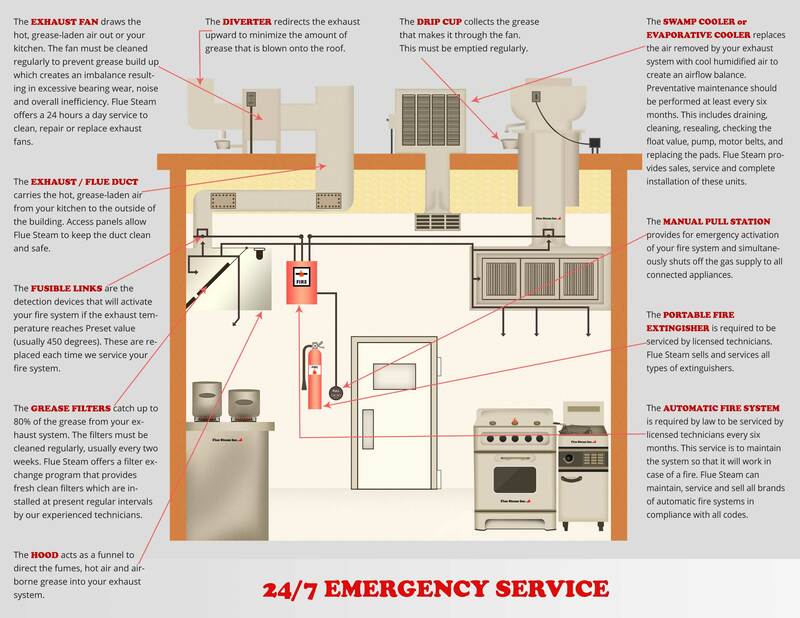 Learn what type of portable fire extinguisher is best for a commercial kitchen. If you own or operate a commercial kitchen, fire regulations dictate that in addition to an automatic fire suppression system, you must also have portable fire extinguishers. This helps ensure that employees will be able to quickly extinguish a fire that may begin in an area not protected by the automatic fire suppression system. Here’s what you need to know about portable fire extinguishers before you choose products to protect your kitchen. Class A: Organic materials like wood, cloth, paper, and many plastics. Class B: Flammable liquids like solvents, lacquers, petroleum greases, tars, etc. Class C: Energized electrical equipment. Class K: Flammable cooking media including oils and fats. ABC Fire Extinguishers are a good multi-purpose fire extinguisher for home and office needs. They use a chemical agent called mono ammonium phosphate to extinguish Class A, B, and C fires. This chemical is corrosive and needs to be cleaned up quickly after use. Class K Fire Extinguishers are specifically designed to fight grease fires in commercial kitchens. They spray a mist of potassium acetate and potassium citrate into the fire rather than a stream to prevent oil from splashing and causing the fire to spread. As the chemical settles onto the cooking appliances it will also help prevent the fire from reigniting. Underwriters Laboratory (UL) tests portable fire extinguishers and provides ratings that describe the product’s effectiveness. The first number in the rating always describes how the extinguisher measures up against 1.25 gallons of water in putting out a fire. For example, a product rated 2A:K would be twice as effective as 1.25 gallons of water (or as effective as 2.5 gallons) on a Class K fire. On ABC extinguishers you will also find a second number that shows the square footage it can handle. For example, a 4A:80B:C extinguisher would contain the equivalent to 5 gallons of water and cover 80 square feet. Most types of portable fire extinguishers come in rechargeable and non-rechargeable versions. At Flue Steam, we highly recommend rechargeable extinguishers for commercial kitchens. This type of portable fire extinguisher costs more upfront, but because it can be refilled after each use rather than discarded it delivers a better value over time.